Here are some photographs of an intermediate version of Capablanca's Chess. 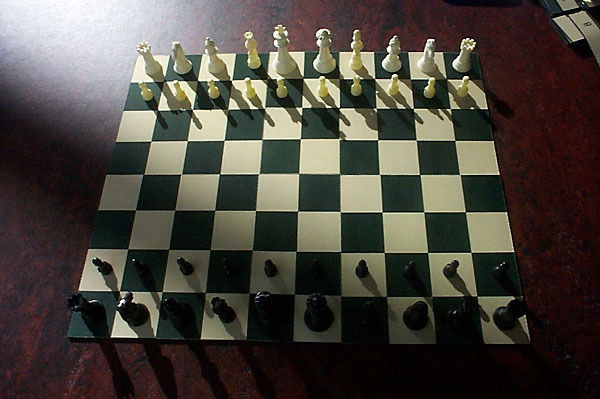 It is a Chess game played on a 10x8 board with two extra pieces. 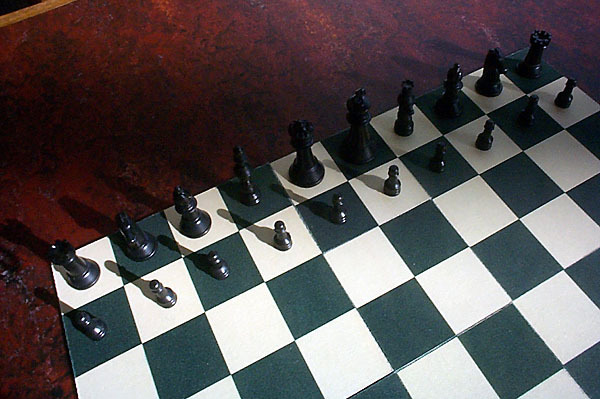 One piece, sometimes called Marshall or Chancellor, moves like a Rook or Knight. The other piece, sometimes called a Chancellor, Cardinal, or Archbishop, moves like a Bishop or a Knight. For these two pieces, I placed a Rook or Bishop from a small set on top of a Knight from a medium set. For the photographs, I just balanced these pieces on top of the Knights. If we were playing the game for real, I would have used Friendly Plastic to affix the two pieces together. Friendly Plastic, a brand name product you can find in a craft store, is plastic which melts in hot water and hardens as it dries. It can be removed and reused by putting it in hot water again. 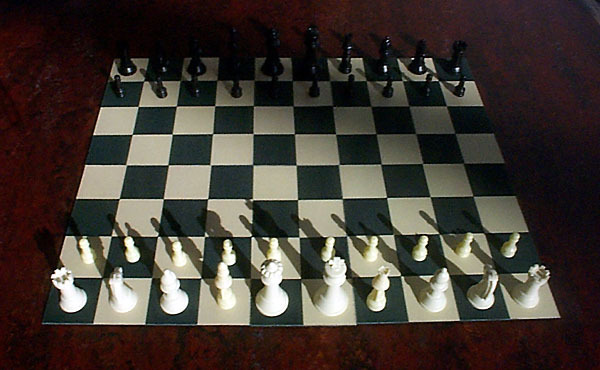 Except for the Pawns, the other pieces are from a larger Chess set. 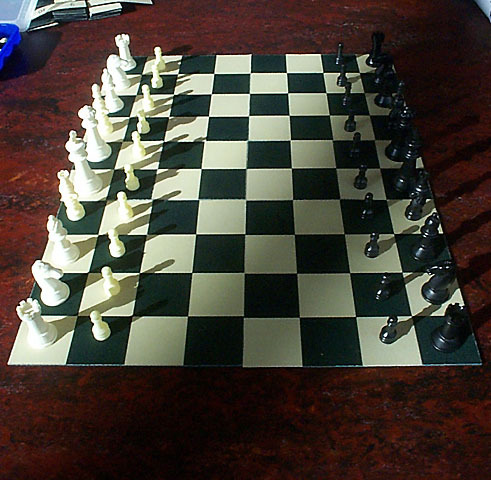 The Pawns come from the same sets as the medium sized Knights, since I had only eight Pawns with the other set. The board is made from 4x4 and 2x2 mats which David Howe made by cutting up some Chess boards. Written by Fergus Duniho. Photographs by David Howe. 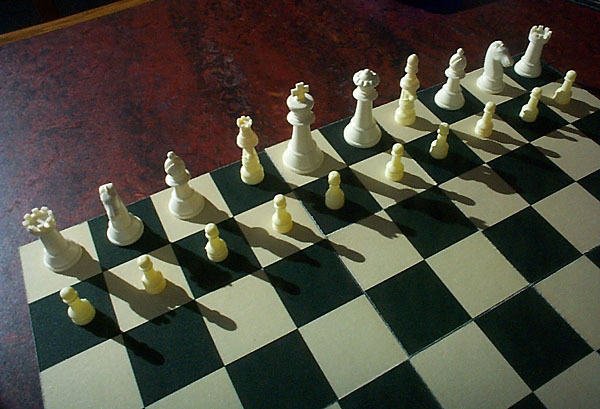 Capablanca's Chess Photographs. Pictures of a set based on Capablanca's 8x10 variant. Author: Fergus Duniho. Inventor: Jose Raul Capablanca.